This is Steve Lacy's work, who played with Monk in 1960. 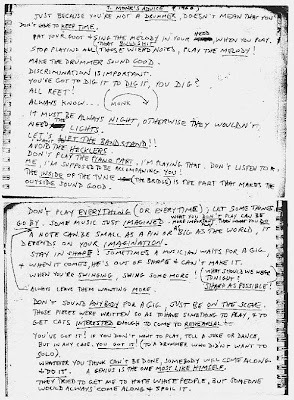 Lacy's introduction to Thelonious Monk: His Life and Music uses the above material explicitly. Our local Perth batsman (and part-time but excellent bowler), Marcus North has waited a long time for his place in the Australian Test cricket team. Now, he has shown his class in a stunning debut innings at the historic Wanderers ground in South Africa wheren Australia scored 466(3.70 runs per over)in their first innings. A superb century on debut from Marcus North and a thrilling boundary-filled innings from Mitchell Johnson allowed Australia to take charge of the opening Test at the Wanderers, and the feel-good factor was enhanced in a final session in which they grabbed three wickets and reduced the run-rate to a crawl. Two century partnerships, both involving North, were followed by a stunning 53-run stand between Johnson and Peter Siddle, which included 26 from a Paul Harris over. Ben Hilfenhaus then took a wicket with his second ball in Test cricket as a glum crowd looked on, and it was clear that if South Africa are to wrest that No.1 ranking, they'll have to do it the hard way. In 132 years of Test cricket, only 18 Australian batsmen have made centuries on debut. Michael Clarke was the last, in Bangalore in 2004, and North joined that select band with a wonderfully mature innings that allowed his team to take firm control. His 117 spanned nearly three sessions and 233 balls, and it was the 113-run partnership with Brad Haddin that changed the complexion of the match. 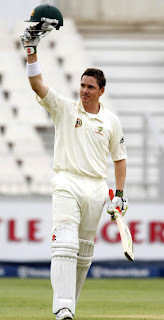 The 117 that he went on to add with Johnson for the eighth wicket was a record for Australia against South Africa, and both stands served to highlight the maturity and composure of his batting. At 29, he's no greenhorn and he came into this Test with 8880 first-class runs behind him. As much as the fluent drives and the precise sweeps against the slow bowlers, what was really notable was his judgment of which deliveries to leave. There were few wild wafts, and initial circumspection gave way to much more positivity after lunch. Thanks to Jayne for passing this on. the saddest are, "My stocks went south." Terry Farrell compered and welcomed the audience last night at The Fringe Gallery's inaugural night of literature and music down in Willagee. Myself and Sally Clarke (pictured) were guest readers, and Rob Binelli was the musician/singer, with instruments created by himself. The open mike section started with Mike (pictured), and included Janet Jackson, Peter Jeffery, Annamarie Weldon, Jo Clark, Terry himself and a young lady singer/songwriter, Susan. It will be on again on the last Sunday of March, so please support The Fringe Gallery readings by attending and bringing friends! I will post full guest list and details before the event. Barrack Obama is visiting a Glasgow hospital. He enters a ward full of patients with no obvious sign of injury or illness, he greets one. The patient replies: Fair fa your honest sonsie face,Great chieftain o the puddin race,Aboon them a ye take yer place,Painch, tripe or thairm, As langs my airm. Obama is confused, so he just grins and moves on to the next patient. The next patient responds: Some hae meat an canna eat, And some wad eat that want it, But we hae meat an we can eat, So let the Lord be thankit. Since childhood, poet Robert Adamson has had a strong connection with the Hawkesbury River, north of Sydney. Producer Libby Douglas and Sound engineer Phillip Ulman travelled to the Hawkesbury and spent two days with Robert, his wife and photographer Juno Gemes. They recorded Robert in his home and on his boat, reading his poetry and talking about his life. Marking International Mother Language Day with Alexei Bayer on translating to and from his native tongue, and how he pronounced the very first word he learned in English, ‘knife’, as Ka-NAIF. When his father leaves, Sean does not know who to blame. Airplay celebrates the work of the late poet Dorothy Porter who passed away late last year with the most famous of her verse novels, The Monkey's Mask. Jill Fitzpatrick is a tough streetwise private investigator on the trail of a missing person. Along the way she encounters cars going out of control on mountain roads, murder, deception and an unforgettable femme fatale. The Monkey's Mask has been described by reviewers as 'A tour de force that manages to be a complex thriller, a state-of-the-gender sexual novel and a convincingly lyrical on-rush of poetry'. It's the publishing world's dirty little secret and it's booming. It's ghost writing. We delve into the world of anonymous scribes who make a living writing other people's stories. Have you ever wondered where writer's write; where novels are crafted; where classic lines are penned? In the first of our writer's rooms series, we take a guided tour of the private writing space of Australian children's author Mem Fox. James Wood talks about his new book How Fiction Works an account of character, point of view, and what he calls lifeness. Flann O'Brien's surreal comic novel The Third Policeman is a kind of rural Irish Alice in Wonderland where people and bicycles swap identity, police stations exist in other dimensions and eternity is reached by taking a lift downwards in a forest. As an outsider, and travelling by rail, Don Watson investigates the meaning of the United States: its confidence, its religion, its heroes, violence, material obsessions, landscapes and people. From the window of the train he peers out to the landscape and history unfolding on the other side of the glass, while within he shares encounters with cowboys, political lobbyists, artists, Christian aid workers, shock jocks, and many other ordinary and extraordinary people. Through them he discovers the incomparable genius of America – its optimism, sophistication and riches – and also its darker side, its disavowal of failure and uncertainty. It is always flattering to be asked to open a series of almost anything, so I'm standing tall - which is difficult for me, right - to be one of two guest poets at The Fringe Gallery for their first Poetry and Performance Night this Sunday night in Willagee. The other poet is Sally Clark with a new book out, if I'm not mistaken. & somewhere there is a musician - I'll need to do more research on that score (no pun intended). The Fringe Gallery is an artist run studio and exhibition space in Willagee which seeks to encourage emerging artists with the exhibition or performance of their work. The Gallery provides affordable exhibition space for hire and runs various art classes for the public. The Gallery also provides five artist’s studio space for lease. Doctor, Pulitzer Prize-winning writer and lifelong Rutherford resident William Carlos Williams is one of 13 greats from the Garden State inducted into the New Jersey Hall of Fame's class of 2008. This year Williams joins fellow literary greats Walt Whitman and F. Scott Fitzgerald as well as popular celebrities Jon Bon Jovi, Shaquille O'Neal and Jerry Lewis. "It's about time," said Daphne Williams Fox, Williams' granddaughter. "I'm hoping it opens more doors for his work." Though throughout the academy Williams is widely considered one of the most influential American poets of the last century, he isn't nearly as well known to the general public. However, Fox and other Rutherford locals have been working lately to make his name better known in the state. "I was taken aback by all the people who supported him," said Fox. "For me this was like coming home again." She noted a book by her father about Williams, "Title," as well as a Caldecott Honor-winning children's book "A River of Words," have recently been published. The Rutherford Public Library has a rotating exhibit of items belonging to Williams, such as his violin, correspondence with his publishers, his straw hats and some of his medical equipment such as a microscope and a blood pressure machine. Williams' dual roles as poet and local doctor are well symbolized by his desk which had a top that could be flipped over with a flat desk on one side for medical work and a typewriter attached to the other side for writing in between appointments. The library's collection is the most extensive of any of its kind, according to library director Jane Fisher. 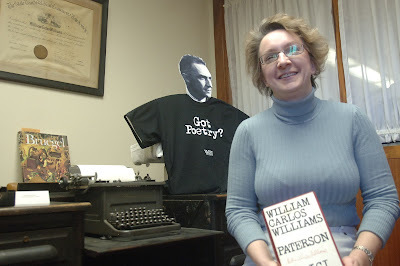 Della Rowland, founder of the William Carlos Williams Symposium which began in 2005 and celebrated the poet's 125th birthday last year, said the work of people such as Fox, Fisher and borough historian Rod Leith over the past few years has helped focus wider attention on Rutherford and its native poet. "I'm pleased he's being recognized in his home area for which he drew all his inspiration," she said. "What's happened here in Rutherford in terms of the poetry readings and everything has rippled out to the whole state." I've had a full week, the highlights of which have been music. First, there was John McLaughlin (gtr), Chick Corea (keyboards), Kenny Jarrett (sax), Christian MacBride (bass) and Brian Blade (drums) electrifying the night air at the Pioneer Women's Memorial Gardens within our beautiful Kings Park (1 thousand acres on the crest of the city of Perth). My friend Perry mused as we walked the long distance from our parking spot, I wonder what they're going to play. Fair question: it could have been mainstream jazz, Indian-tinged pyrotechnics, night club fusion or any number of things in between. They sauntered out on to stage - a blue lit giant music shell before the lake - and swung right into a fast electronic contemporary jazz piece, influenced mainly by McLaughlin's guitar. The compering, such as it was, was shared between John and Chick. Very little chatter, but relaxed announcements. In John's humility, he always introduced all the rest of the band, perhaps thinking or knowing that a lot of people were not essentially from the jazz world but the rock-end of fusion - Mahavishnu Orchestra et al. John introduced the second piece, which was a composition by Chick Corea. The solos were always exciting, and built to a point just after when I expected them to release, if you catch my drift. You would expect the world of John and Chick, and you'd be right. Kenny played a more restrained role, like he was a second-stringer - but nothing could have been further from my mind. Kenny was one of the main reasons I went. It wasn't he went into his shell or anything so dramatic, just he wasn't as front-line as I had hoped. The drummer's name was stated a lot during the performance, but I am only guessing at Brian Blade. He was a fiercesome storm behind each number, and even when he switched to brushes for a quieter segment, he was still as busy as Elvin Jones. 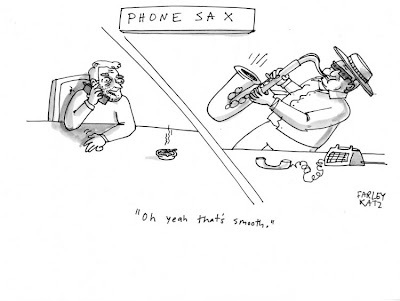 At times I miss the subtle playing style of people like Max Roach or Connie Kay, but perhaps I'm an old fuddy-duddy. The eye-opener, or ear-opener more accurately, was the masterful and melodic playing of Christian MacBride. A beautiful bass player in anybody's book, be it electric or bull-fiddle. He was a revelation to me - memories of Jaco Pestorius and Charlie Mingus flew through my intoxicated head. A stand out piece was the Hymn to Andromeda, a new piece composed by Chich Corea and about to be released on a new CD. It started with synthesizer and electric piano, and permutated through sections to a frenetic jazz crescendo as endo. I would have liked a return to the original theme and instrumentation as denouement, but that's my mind, tidying up. Another piece worth mentioning was the surprise inclusion of Dr Jackyl, a track first released by Miles Davis 50 years ago. The evening was perfect weather, funky coffee, huge and appreciative crowd, kookaburras laughing on cue, and over two hours of music (I didn't keep a watch on it). Parking was the only drag, but that's average for this kind of event, isn't it. An American friend has described a recent night out at a Cassandra Wilson show - and I think ours, slightly different in that it was a concert in the outdoors, was a far superior event. But it did cost $80. Secondly, there was Stockhausen's Stimmung, performed by the Theatre of Voices at University of Western Australia's Hackett Hall. I went in ignorance of this work, even though friends had offered to let me borrow their CDs of it. I wanted to be surprised and to take the creative journey as freely as possible. This meant not researching the piece. It was an amazing journey - incredibly beautiful music sung by six voices, and wit and improvisation all combined. I didn't understand a word of the German songs and poems embedded in the work, but that didn't matter one iota. When it finished - about an hour and forty minutes - I wanted them to start again. When I arrived home, I immediately researched it and read the program notes, etc. & then was even more amazed. Absolutely beautiful piece of music, but very difficult to pigeon-hole. Somewhere it has been said that Stimmung is a perfect doorway in to Stockhausen's work for the uninitiated, and I would agree with that. 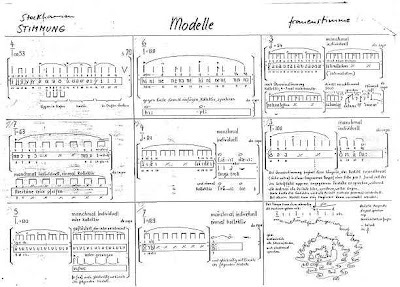 I have heard lots of Stockhausen's works, but this is the most lyrical and witty. 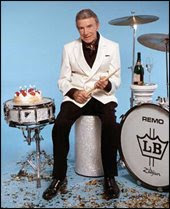 Louis Bellson,world famous jazz drummer, has died at the age of 84 in Los Angeles. He was a great jazz musician, composer, arranger, bandleader, and long-time educator. Louis Bellson won the 1940 Slingerland National Gene Krupa drum contest at the age of 17, cutting out 40,000 drummers and launching a career that began with the Benny Goodman, Tommy Dorsey, and Harry James big bands. I remember him from the early ’50s with Duke Ellington, when he wrote and performed a monumental drum solo piece Skin Deep. It was one of the reasons I learnt drums as a teenager (but you blame it all on him). He left the Ellington band to work as musical director for Pearl Bailey. They married in 1953. The marriage lasted until Bailey’s death in 1990. Tonight we hear some of the greats of contemporary jazz, right here in Perth, in our thousand acre park overlooking the city. The venue sounds idyllic, but will the sound be idyllic? It depends on the night winds blowing and the amphitheatre acoustics of the Pioneer Women's Fountain location. Not ideal for my once in a lifetime chance to see these guys together - but, that's the deal. And I am looking forward to it. The audio is available to download and you'll also find transcripts, photographs, interviews, and more. We hope that this website will be an ongoing resource for researchers, schools, universities and the general podcast audience. Subscribe to the podcast series here at http://www.abc.net.au/rn/poetica/features/pod/default.htm. To mark the launch of this special podcast series, four of the programs will also be broadcast on Poetica, continuing with Jayne Fenton Keane on Saturday 14 February at 3pm. There must be the right words to say about the bush fires tragedy in Victoria but I haven't found them. My mouth dries up whenever I let my imagination go to the last seconds of those poor victims' lives. Blame? The game has begun, as we all knew it would, but I hope it will peter out through lack of support very quickly. A cohesive and solid plan for the nation for such tragedies in future is the only activity worth pursuing now. Perhaps Tim Flannery and General Peter Cosgrove could be asked to head such a multi-disciplinary team. The immediate on-the-ground task is the re-establishment of the survivors' lives, and many heroes are already working day and night at that task, from the armed forces to local CWA groups. I thank them all for doing what I can't help do from this distance. The Sydney Writers Centre advertises writing courses of all sorts and styles, some at the Centre and many on-line, but as a free tip today they sent a short piece on Plurals at http://www.sydneywriterscentre.com.au/ . I think it is worth sharing as many people get these areas wrong consistently. Noun plurals - there are so many irregularities here that it can sometimes be difficult to find the right word! Some of these may seem obvious but it’s amazing how many times people get it wrong. Creative Writing Workshops - All welcome! Thanks to Doug BARBOUR for this one. A couple of phone calls have come in for people wanting to know what time it starts. That's strange because I always write the hours it runs when I advertise it. Oh, well, maybe they just want to make contact first, and use that as an opening gambit. Seeking poems that explore the twisted world of David Lynch's Blue Velvet for The Private Press's next chapbook anthology. Word of the Year? Check it out! The Macquarie Dictonary has a very entertaining site with lots to amuse any wordsmith. They have selected a Word of the Year and also a list of winning new words in various categories. Steve McCaffery: If the aim of philosophy is, as Wittgenstein claims, to show the fly the way out of the fly bottle, then the aim of poetry is to convince the bottle that there is no fly. and home of The Fellowship of Australian Writers. $20 per session or 8 weeks for $120. Conducted by Dr Andrew Burke, a Creative Writing teacher with a couple of decades experience in steering people towards creating texts in their own voice.